Down Home Delivery & Catering is located in the heart of Dorchester, Massachusetts in the vibrant Four Corners section. Down Home Delivery features authentic homemade Southern fare with excellent value and generous portions. Down Home Delivery has been operating for over 9 years and is family owned and operated by the Webster family out of Macon, GA. The restaurant offers full breakfast and dinner menus containing mouthwatering homemade delicacies that make you feel like you're "home." We take pride in the processes we use to prepare our South delicacies, just like the "cooks" we all know from the South. Every week we hand cut all of our vegetables, yams and potatoes. We don't use any canned food. All of our meats are purchased weekly from local suppliers. Our proprietary seasoning gives all of our dishes, especially our fried chicken and fried fish a unique flavor. Our dinner menu features many traditional Southern favorites like fried, BBQ and smothered chicken, BBQ pork and beef ribs, fish, and scrumptious side dishes like collard greens, baked macaroni & cheese candied yams and potato salad. We've added a weekly special which will be posted on our website each week. Examples of specials to be offered include Oxtails, Steak Tips, Beef & Sausage Lasagna, Curried Shrimp among others. For the health conscious, we do NOT use pork to season any of our food, only smoked turkey. In addition, we've recently added garden salad and brown rice to our dinner menu. All of our homemade desserts are baked fresh on the premises by our baker. Down Home also offers full service catering for any size event or occasion. Let us cater your next event. Visit our Food & Events Galleries for pictures of some of our dishes and events that we've catered. 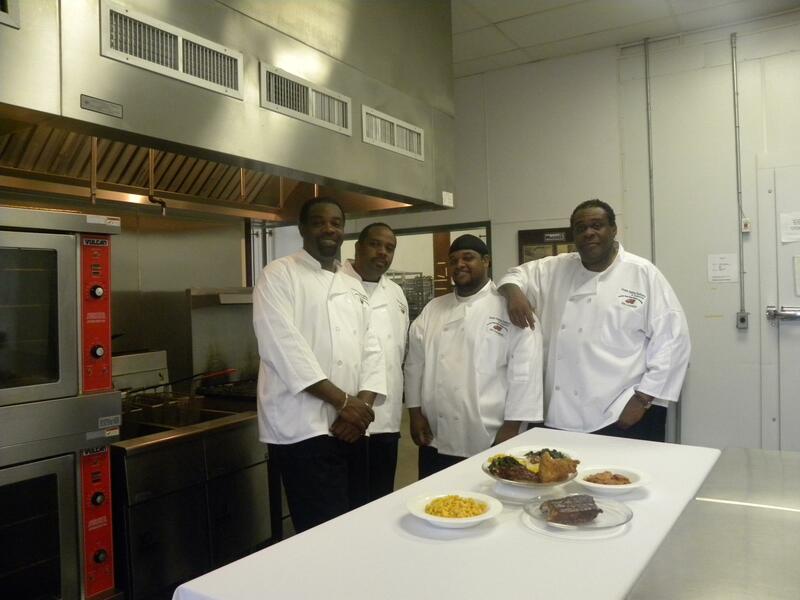 Our restaurant facility at 2 Bowdoin Street in Dorchester, MA contains a state-of-the-art commercial kitchen where our chefs work daily to prepare all of your traditional Southern favorites. We are a fully licensed and insured business as well as a Massachusetts state certified Minority Business Enterprise (MBE) and Disadvantaged Business Enterprise (DBE) thus we are authorized to accept State and DOT related contracts. Formerly offering only take-out and delivery service, we recently completed and opened our beautiful, new dining room featuring art from local artists. Thus, whether you pre-order and pick-up, walk in and order to-go stay and dine in our new diningroom, you can access and enjoy our exquisite version of Southern comfort food in a manner that is most convenient for you. From our delicious entrees and side dishes to our freshly baked desserts, we’re committed to serve you quality food at a fair price. Using traditional recipes passed down through generations of great cooks from Macon, Georgia, we’re proud to keep current a culture, flavor and passion for food that is often lost with our fast paced Northern lifestyle. So, we invite you to relax and allow us to prepare a feast for you; filled with all of the love, patience and comforting memories of home!